Too few people realize that local SEO is mostly organic SEO plus a few other moving parts. I (and others) have found that without also doing what it takes to rank well in Google’s “10 blue links” results, you won’t grab as much visibility for your business on the local map. 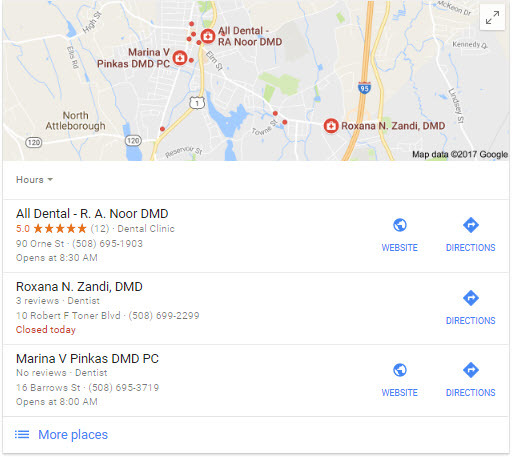 Local visibility isn’t a lovechild of a Google My Business page + local citations + “optimized” site (+ spamming when convenient). Rather, it’s the result of a smart, labor-intensive organic SEO campaign with a couple of twists. As you can probably tell, the idea I’m trying to get across is that your local rankings are hollow and fragile without that solid core of organic SEO work. Having a website and local directory listings for a business with a keyword in its name is not a strategy. Even if that low-effort approach seems to work, the rankings likely won’t last, and if they do, you still probably won’t rank for as many search terms as you otherwise could. Google knows where your business is located and (probably) what you offer. But how does Google know you’re any good? In a semi-competitive market, Google will usually cherry-pick. It does that, above all, by seeing how good your links are and how much good in-depth info you’ve got on your offerings. Most of the ranking factors in each circle should be clear, but a few I should explain a little. While I’m at it, I should also define each of the 3 circles. Work on the things in the dark-blue, innermost circle and you’ll rank well, whether or not you’re a “local” business. 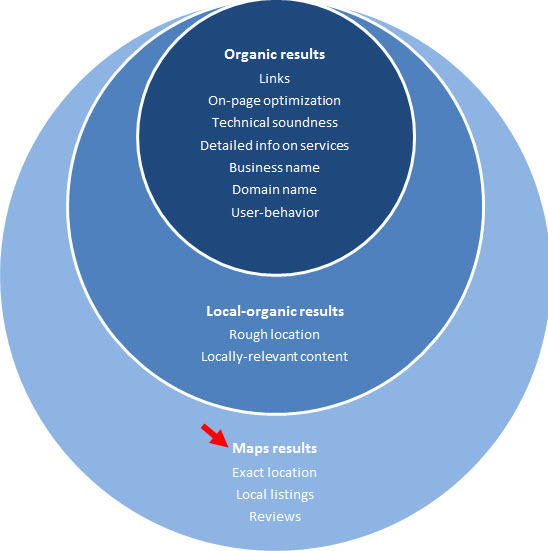 Organic results are often non-local. But sometimes they show local businesses, and show different local businesses based on your location. Note on “Business name” factor: What your business is called has some influence on what search terms you rank for in the organic results. But, sad to say, it’s even more of a factor in how you rank on the local map. Now, an argument could be made that I should have “Business name” in all 3 circles, because it affects your rankings everywhere. I’ve chosen not to do that. For one thing, it’s messy. Also, in my opinion you shouldn’t name your business differently just because at the moment it’s an inflated ranking factor in the Google Maps 3-pack. To me, how you name your business is part of the core strategy. Note on “User-behavior” factor: How searchers interact with your site – both when they see it in the search results and when they’re on it – seems to matter to Google. “User-behavior” might include things like how many people click on you vs. on a competitor, what terms they typed in before clicking on you, and whether they hit the “back” button or dig deeper into your site. In my experience, that can help your organic rankings. But there’s also local user-behavior that may matter, like what customers’ mobile location-tracking data tells Google, lookups of driving directions, and which businesses in the 3-pack attract the most clicks. Again, tough call as to which circle(s) to put “User-behavior” in, because it’s really common to all 3. 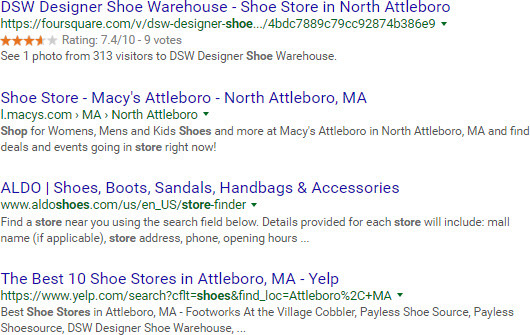 Since 2012, Google has shown local-business results in the organic search results. They’re mixed in with the other “10 blue links,” usually right below the local map. 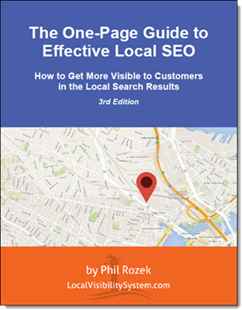 Often businesses that rank in the map also rank in the localized organic results, and vice versa. You’ll probably show up prominently in the local-organic results if you’ve got at least some of the factors from the “Organic results” circle going for you, and you happen to be a local business – with or without a Google My Business page or other local listings. Note on “Rough location” factor: Google’s organic results aren’t as location-sensitive as the Maps results are. Even if your business isn’t located in or very near your target city, as long as it’s in the vicinity, it should be at least possible to rank in the localized organic results. Also known as the 3-pack, or Google Places results. You’ll only appear there if you’ve got a Google My Business page and – in markets that are even a little competitive – if you’ve also got the factors from the other two circles working in your favor. Note on “Exact location” factor: Sometimes your Maps rankings depend on whether your business is 1 mile or 1/4 mile from your customer. Location (of customer relative to business) is usually less of a factor if you’re really dialed-in on your organic SEO (that is, if you’ve got enough good links to suggest to Google that you’re a prominent or authoritative business). Does my diagram make sense to you? Is it clear what each ranking factor refers to? On “exact location” factor. How does that work for a Service Business where the service is delivered to the Customer’s home as in the case of Lawn Care Service contractors? Because Google still has your address on-file (just not showing publicly on your Google My Business page), Google still takes it into account when figuring out where to rank you. Whether the address shows publicly has little or no direct effect on rankings. 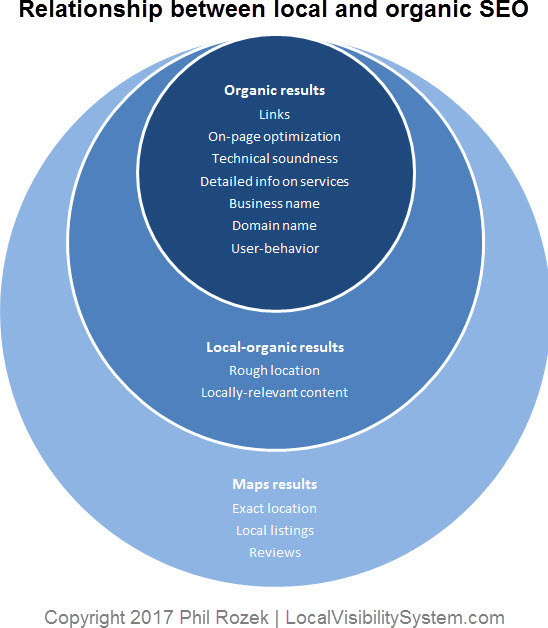 Excellent visualization of the concept of local vs. local-organic vs. organic Phil. I really like the way you’ve done this. Will be sharing it, for sure. Do you think that Social Local SEO, like Facebook Local or Instagram does have any influence also? Great article. Never thought of it like this. Always wondered why the Google did give these variations in local results. Thank you. Directly, no. In my experience, those “social” factors only help rankings insofar as they get people onto your site who spread your name / build your brand, link to you, or become customers who review you. Just beginning organic campaign for a local SAB in a very competitive niche. I’ve assumed that the 3-pack is pretty much not in play as all the existing 3P businesses plus first 3 in expanded have directions. However, there are several SABs in the expanded listings which begs the question can one of these SABs ever show in the 3 pack? SABs can rank in the 3-pack just fine. Their location still matters, though, and they have to pay attention to all other parts of local SEO. Good stuff here Phil. One thing on the last “Maps” portion…if you’re not in a market that is even a little competitive, or simply dominate your competition, the Local Pack may not show but you will have the Knowledge Panel (box on the right) all by yourself. Thats a good feeling. Good point, Brian. I considered adding something like “Picking your niche” as a factor to one of the circles, but that would have been tough. Still, as you alluded to, in local search it’s much better to be a big fish in a smaller pond than the inverse. Great chart you got there Phil. I think it’s interesting that Google insists on using names as ranking factors. This is frustrating. It reminds me of when domain names used to almost require keywords in them to rank. If we can move past that, why is this so hard? I think it’s ironic that the company making it so that people write for people (and not search engines) is encouraging businesses to name themselves for the search engines! I can see why it’s done, but it just makes things harder for companies with creative names. Has this caused you any big trouble with a client in the past? I hear you, Mohammad. Google does over-weight the name as a ranking factor. Arguably it should matter somewhat, but not as much as it does. Very nice article Phil. It seems the puzzle to SEO, is always changing as Google switches techniques, algorithims and the like. Once you think you understand and have figured it out, they switch gears on you. But I think your article helps clear up a lot of things Dr Organic Phil! Google sure does like to twist the knobs. “Organic” has always mattered to one’s local rankings, but it’s seemed to matter increasingly more in recent years. great read Phill, i love reading your articles, very insightful. Excellent and timely post Phil as my new client has asked me how come they can’t get onto Maps. I was trying to find a good way of explaining it (and get it clear in my head) but your diagram hits the spot. My client is a local business showing up organically on first page (suppose circle 2?) but not in the maps. I’m taking it that this is because he is missing enough local listings for this to be an impact factor? What’s your take on that? Phil: I thought I’d add this observation on your site and on a topic related to links in some way. Your inner most circle about ranking includes the topic links though you didn’t go into depth on it. Of interest in the latest local rankings factor survey plus the research from localseoguide.com links were referenced quite a bit with regard to higher rankings. I’m in the midst of updating some sites. We are updating the look, the content, and reviewing what we have to date. We discovered old posts with broken links and outdated content. We’ve been cleaning that up. Most of the broken links go to websites that no longer exist and/or to sites wherein the site changed the targeted content and redid the page. So we’ve cleaned up a lot of old broken links. Supposedly that improves rankings. Hopefully this “spring cleaning” will help with that. Similarly we were looking at old links to our site and comparing what we see today to what was in existence in the past. Of note we have been knowingly and deliberately adding links to sites since 2004–13 freaking years!!!!! Here is the big find—duhhh!!! Links to your site get lost. Webite urls of all sorts vanish. Businesses close, blogs are deleted or the blogger gets tired and stops hosting the site, one business gets purchased by another and they delete the content to your site, editors of sites change and they don’t like the content to your site: Bam…the link to your site vanishes. Sites that linked to you that were once strong are now weak and ostensibly the link(s) to your site have lost value. Did you get referenced in news sites with links? Well if it was many years ago or even a few years ago if the site keeps publishing content the articles that linked to your site get buried. They lose strength or relevancy or both. The link(s) might still be there, but they aren’t potent. Did you get links from organizations or non profits? They come and go also. And when they have lost participation and membership those sites close also and your links vanish with the no longer active organization website. Time and life move on. So do links on websites targeting your site. You actually need to keep adding links. Because if you don’t natural time and attrition will cause some of those links to vanish. While that is happening your competitors will be adding new links. As your diagram shows links are important. Over time you simply have to work to keep adding them. If you don’t your site loses the strength and ‘link juice” from sites that are no more. Those broken / misplaced / missing links sure can be helpful. Of course, I agree 100% on the importance of links, but I’m not sure how I could have gotten deeper into that topic without getting totally sidetracked. Much ink has been spilled on it (as you know). Phil: You didn’t need to be. I simply wanted to point out something I recently got a real grasp of: Over time a site loses links. I’ve recently focused close up just how many our smb’s have lost. In aggregate a lot. So on top of all the other comments on why the link element for ranking is important is that every site loses links over time. Every one. In order to keep link strength up to help in getting high visibility both in the local pac and in organic, one simply needs to continue to add links, some of which replace the one’s we lose (which occur for a thousand different reasons). I merely wanted to highlight a fact about websites, and tie it back to the importance of getting links, for rankings. And meanwhile while I went through these sites and some old dated blog posts…I’ve found a lot of broken links. Just as some of the sites that linked to us are no longer around so to are some of the sites we linked to years ago. All corrected now.